Double your exclusive fun and save big! Get exclusive two-packs from Rogue One and The Last Jedi that never made it to big box stores with four exciting action figures. 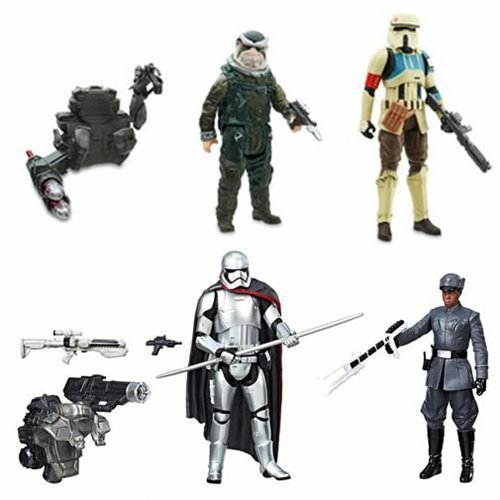 Order this bundle and you'll get Star Wars: The Last Jedi Finn (First Order Disguise) vs. Captain Phasma 3 3/4-Inch Figures - Exclusive as well as Star Wars Rogue One Shoretrooper and Bistan Action Figures - Exclusive! Don't miss them! Join the fearless Rogue One Squadron with this Star Wars Rogue One Shoretrooper and Bistan Action Figure Set featuring the faceless troopers of the Empire alongside the brave Rebel Bistan. 3 3/4-inch action figures come fully articulated for battle with rocket launcher backpack, 2 projectiles, and 2 rifles. Ages 4 and up.